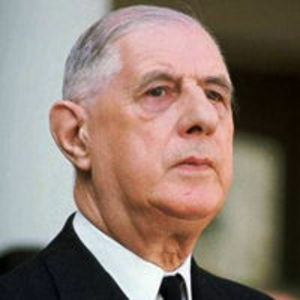 One of the greatest figures in the history of France, General Charles de Gaulle, has died at his home of a heart attack. He was 79. The wartime hero and former president was playing patience and watching television when he suddenly slumped in his chair. His wife, Yvonne, called a doctor and priest, but he died within minutes. There was no warning: this afternoon, he took his usual walk in the gardens, then worked on his memoirs in his study. "One or two to remmeber, that is."